Wednesday September 23- 1931 I wrote Alice Conden a long letter in the forenoon and Dr Flock of Boise called here. Soon after dinner Hattie came we went to a picture show. Saw George Arliss in "Alexander Hamilton" I went to do some errand she went home. Later The Hedges came and took me up to see Johns family. Evening at home. Thursday September 24- 1931 A cloudy rain with rain late in the day. I fixed my blue gorgette dress. Wrote Winnie in evening Friday September 25- 1931 I sewed all forenoon. In the afternoon did some washing & cleaned the rooms. Letter from Laura and LeGrand. They expect me soon. In evening wrot Kate Rowe and marked the paper to send to LeGrand Saturday September 26- 1931 Mary came and took me up town and down to The Depot to see about ticket west. When I got back I dressed to go to Elder Daughters party. Hattie came and we went by taxi. Later went over to see Aunt Emma & Anna They are wretched. Rob brought Birdie up this afternoon I did some work after supper and wrote LeGrand. 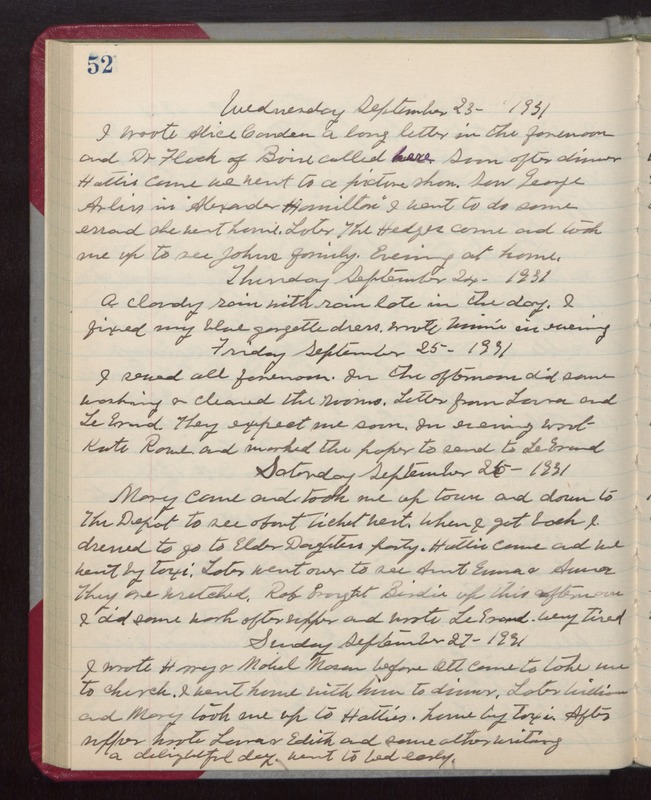 Very tired Sunday September 27- 1931 I wrote Harry & Mabel Mason before Ott came to take me to church. I went home with him to dinner. Later William and Mary took me up to Hatties. home by taxi. After supper wrote Laura & Edith and some other writing A delightful day. Went to bed early.